Did you all know that Mother's Day is only a week and a half away? Where is the time going?? With the holiday quickly approaching it's time start shopping for those super women in your lives. 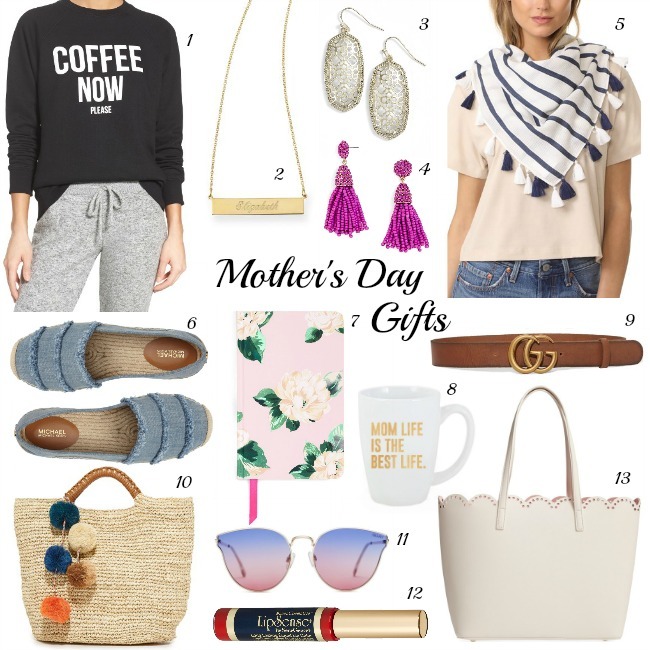 Whether you want to get something special for your mom, your best friend, or yourself (because us moms do deserve a little something), I've rounded up gifts that work for everyone. These are sure to put a smile on that mom in your life's face. If you've read just a couple of my past blog posts, you will recognize this Sarah Chloe name plate necklace, because I wear it everyday. I think name or initial jewelry of one's kids make the perfect Mother's Day gifts. Not only are they personal, but they are also sentimental. I love the daintiness of this Sarah Chloe necklace. It layers perfect with all of my other jewelry, and the quality and price are right on. They are available in different finishes (14k gold, silver or gold plated). Mine is gold plated and I've had it for three years, and it has not faded or tarnished. If you're mom already has a name or initial necklace, then earrings are the way to go. Tassels are huge this season, and this pair is perfect for wearing the trend without being overwhelming. Speaking of tassels, how cute is this striped tassel scarf? I've mentioned in the past that I love giving scarves because not only do they fit everyone, but they are a fun way to dress up an outfit. Bags and shoes are another gift I love giving (and receiving), and these fringe espadrilles are so fun. If you're not into the fringe, then this stripe pair makes a great option. With summer approaching, a beach tote makes a great gift, and this straw pom pom tote can be worn from the beach to drinks. I'm also in love with this scalloped bag, and it's under $50. Pretty journals, notepads, and stationary are things that I love to have, but I never buy for myself, so I love getting them for gifts. And of course, a new pair of sunglasses are my favorite thing to receive. If you haven't tried LipSense yet, then you need to! It's a long lasting lipstick (it last between 4-18 hours), that is kiss proof, smudge proof, and waterproof. Not only does it actually stay on your lips, but it makes them healthier over time. With over 30 colors to chose from, it makes the perfect gift for your mom. Many of you know that I love it so much, that I now sell it. You can order it by sending me an email (threadsforthomas@gmail.com) or visiting my FaceBook page here. Also, I've teamed up with some other bloggers to host an Amazon giveaway. Enter below to win a $500 gift card. This $500 Amazon Gift Card giveaway is brought to you by the bloggers above. It is open to the U.S. and Canada. You can enter by performing the actions below in the Rafflecopter, marking that you have done them and providing your name/username for us to verify. Each entry has a link so it makes it easy to do the actions. Giveaway runs from May 3 - May 17, 2017 (concludes at 12:00 AM on the last day). Winner will be announced within 10 days of the conclusion of the giveaway and entries will be verified by the hosts. Thanks for participating, I can't wait for you to see all of these awesome bloggers! Terms and conditions are listed in the Rafflecopter. *This post contains affiliate links. All thoughts and opinions are my own. Thank you for supporting the brands that I love here on Threads for Thomas. Love these picks! My mom is in need of a new beach bag! Love your straw tote - it might be perfect! That coffee sweater is lovely! I want both totes too! Some fun gift ideas here! With mothers day fast approaching i need to get on this!